Back in the old days, ventilation typically stood for fans that extracted stale, odiferous, and otherwise disagreeable air from the kitchen and bath. In these days of energy consciousness, we have become aware of how wasteful pumping out freshly filtered and conditioned air actually is. The furnace or AC unit must work overtime to compensate for this loss, costing precious dollars and resources. 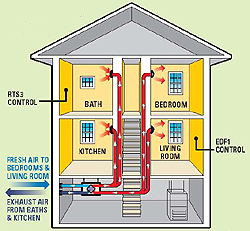 Couple this with new construction technologies that make for better insulated and sealed homes and a perfect storm is arising, as now depressurization and backdrafting appliances become possible by extracting air without replacing it. For the kitchen, due to the volume of air needed to remove smoke and other particles, at this time there is no good answer other than what we currently use. Make-up Air Provisions are becoming more prevalent in Building Departments around the country for Kitchen Fans drawing more than 300 CFM. But that is a whole ‘nother kettle of tea we will examine in a later post. Bath Fans, however, can benefit from some newer and energy saving ideas. We have been seeing more and more folks use Heat Recovery Ventilators (HRVs) for venting the bath, as these remove air as well as replace air due to an air to air exchanger that can capture up to 90+ percent of energy from the outgoing air. They can utilize the same grilles as our traditional bath kits and operate just as quietly, as an added bonus, they are adding a small amount of fresh air to the home improving indoor air quality. As illustrated above, the HRV can really make for a comfortable environment in the whole house. The economics of installing one are not as bad as one would think. Once you are looking at a bath fan or two, the jump to the HRV is not large, especially given the benefits of the unit. For those that are sensitive to allergens, an inline filter box can be added to the fresh air intake to cleanse the incoming air. For sizing, we like to stick with the tried and true method of 1 CFM per square foot of area in the bath, which gives us roughly 8 air changes per hour. Therefore, the VH704 for instance could be used on a traditional “Hall Bath” of fair size given its’ 70 CFM. Most will fall into the SHR1505 and its’ 147 CFM, although this could do a good size bath or two and perform general ventilation of a laundry room as well.